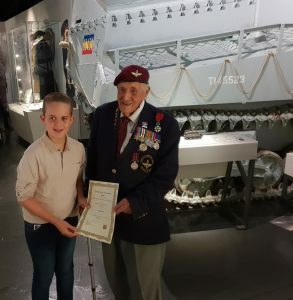 On the 18th of August one of our Trustees (Mark Waring) had the honour of presenting Finlay George with a certificate at the D Day Story for his fundraising efforts. 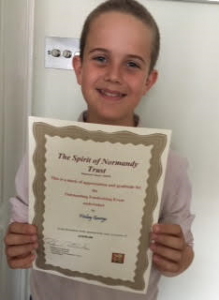 You’ll remember from one of our previous posts that Finlay shaved his head to raise money for The Spirit of Normandy Trust. Fortunately there happened to be a veteran visiting the D Day Story museum in the form of Arthur Bailey (49th West Riding and later Parachute Reg.). Arthur kindly presented the certificate after a total of £1050 was raised. Arthur’s presence and thanks made the presentation all the more brilliant. Arthur landed on the 6th June on Gold Beach and took part in the batlle to liberate Caen. After this he transfered to the Parachute regiment and took part in the Amhen campaign.